The Virginian quintet took the stage to "The Passing" and then tore into "In Your Words." The band stalked around the massive center stage and assaulted everyone with they're southern thrash metal. Lamb of God always impresses me when they perform and this was no exception. The band was tight as always and kept their 45 minute setlist rolling like a fined-tuned machine. 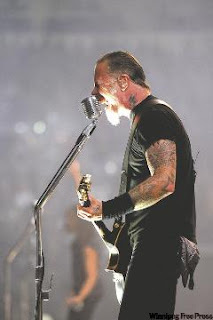 Songs like "Walk With Me In Hell" and "Laid to Rest" just enhanced the crowd's need for metal and when they departed, the audience was hungry for Metallica. Let me paint the picture for you: Lights go out. "Ecstacy of Gold" begins to play. Everyone reaches for their lighter and starts cheering. The blackness that was once the MTS Centre now has thousands of tiny orange lights flickering in the distance. Metallica makes their way to the stage and open up with "That Was Just Your Life". Lasers cut through the darkness while a single spotlight lights James. The lightshow had me wondering if Metallica had Pink Floyd's lights on loan at first, but I soon forgot and I was caught up in the agression of Metallica's latest efforts. The setlist was pretty impressive. It had a good mix of classic Metallica accented with double shots of the new stuff. But the highlight for me was their laser-lit performance of "Master of Puppets" immediately followed by "Damage Inc." They finished off the night by turning up the houselights and dropping black, Metallica-labeled beach balls on the crowd and asked for their help in singing "Seek & Destroy." The pyro throughout the show was impressive and there were eight, enormous coffin-shaped lighting rigs spread across the arena. However, the lack of video screens was a little disturbing to me and the stage itself wasn't as eye-catching as the last few tours. Metallica currently has 19 shows in 15 cities to close out the year. Check out Metallica's tour page for more information on the dates and venues. If your an old-school or a new-school Metallica fan, you should take every chance you get to see them perform because they never disappoint. I give this concert a solid B.
Yep, Metallica came through in January with Machine Head and The Sword. But still.... Gojira!